Editors’ Note: This education dispatch is part of a new ongoing series reported from Mission High School, where youth issues writer Kristina Rizga is known to students as “Miss K.” Click here to see all of MoJo’s recent education coverage, or follow The Miss K Files on Twitter or with this RSS Feed. What’s particularly interesting about Mission High is that while it has historically ranked among the lowest-achieving schools in the district, recently it’s made significant strides. As I reported here, dropout rates at Mission High fell from 32 percent to 8 percent in one year. Test scores shot up. College acceptance rates grew. That’s especially impressive in near-bankrupt California, which ranks 47th in the nation [PDF] in terms of school funding per student. So what is the staff here like? Let’s meet a few of the people we’ll be following in the months to come. Across from Mission High School on a gorgeous sunny day, San Francisans dot the lush green expanse of Dolores Park. I duck through the school’s entrance 10 minutes after the bell and wonder how many teenagers are still lounging under palm trees at the park. “How’s it going?” I ask Joe Alberty, one of six security guards at Mission High, as he stands in the front hallway shooing students into class. “Like Sunday morning!” he says. The light glints off the yellow linoleum as I walk down the hall. Mission High loves its yellow: yolk yellow on the floors, soft yellow on the walls, zingy yellow on the metal lockers. I wonder how they keep these hallways cleaner than my apartment, with 880 students and about 60 staff shuffling in and out all day. So far, I’ve seen just a few sunflower seed shells by the water fountain, two straws, and three gum wrappers. 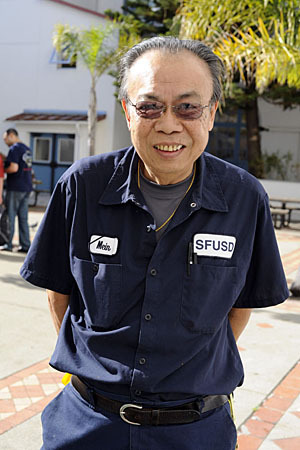 Shortly after, I meet 65-year-old Mein Ho, who’s been keeping this school pretty spotless for the past 21 years. He’s one of five full-time janitors at school. —Mark Murrmann, Mother JonesI pass dozens of classrooms and see no more than 20 students in each classroom. (Principal Eric Guthertz tells me that Mission High receives state funding requiring small classrooms, among other things which we’ll look at in future dispatches.) The class sizes now range between 16 to 28 students. The classrooms and hallways seem quiet and serene. Until the bell goes off again. As it rings, the classroom doors burst open and a sea of teenagers stream down the hallways. The noise level shoots up, and now I feel like I’m at the San Francisco International Airport. I hear English, Mandarin, Russian, and Spanish as backpacks bump into my shoulders and we all move down the hall. Because many of Mission High students have been in the U.S. for two years or less, you can read the school’s website in 12 languages. To my right, two teenagers exchange a complicated handshake. I can smell tortilla chips in the air. I introduce myself to a ninth-grader Carlos, a soft-spoken student from El Salvador with spiky black hair and a fake diamond earring. Carlos tells me he moved to the United States four years ago, reuniting with his mother for the first time in 14 years. (His mother moved to California to work as a janitor, and Carlos couldn’t legally join her until 2006.) He tells me he likes Mission High, and his favorite classes are math and music choir. Favorite teachers? Math teacher, Taica Hsu, and choir teacher, Steven Hankle. Carlos wants to be a math teacher when he is done with college. To my left, an Asian American student greets her teacher. 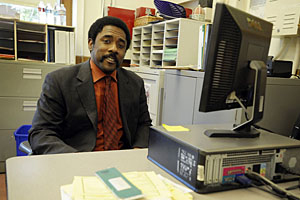 “Hello, Mr. Scott!” I recognize Tadd Scott, the English teacher I met a few weeks earlier at a teacher’s conference, where he was passing out fliers about an upcoming Haitian Dance and Arts Festival at Mission High. “Have you seen my portfolio, Mr. Scott?” another student asks him. Mr. Scott beams at the student. They both move down the hall. Want to find out what happens next to Carlos, Mr. Scott, and the rest of Mission High School? Click here to see all of MoJo’s recent education coverage, or follow The Miss K Files on Twitter or with this RSS Feed.